The features of AC arc burning. The diagrams of currents and voltages for the AC arc. It should be noted that all the properties of the DC arc are inherent in the AC arc. When the arc burns at the alternating current of 50 Hz, there are conditions that reduce the stability of the arc combustion. First of all, it is worth noting that when the polarity of the arc is changed on the electrodes, when the arc voltage (transformer) is zero, the arc goes out. Thus, the welding arc goes out, and then ignites again 100 times in 1 second. This causes special requirements to the power source of the arc (transformer) and to the welding circuit. 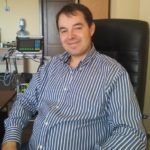 The main influence is the inductance of the welding circuit (in conjunction with the inductance of the transformer). 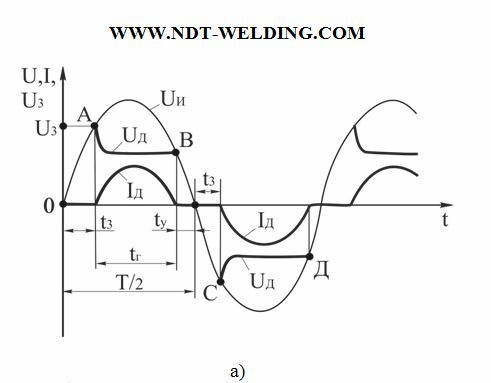 Usually, two limiting cases are considered when analyzing the stability of an AC arc: 1 – only the active resistance in the welding circuit; 2 – there is mainly inductive resistance in the welding circuit. 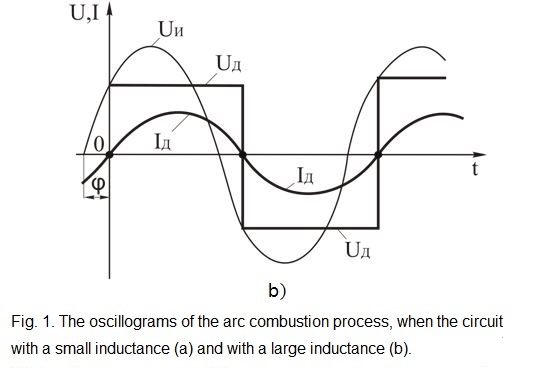 Let’s consider the process of the arc burning, when in the welding circuit only the active resistance (L = 0). The arc burns intermittently (Fig. 1a): Uи – the voltage of the source; Iд – the arc current; Uд –the arc voltage. In such chain, the vectors U and I coincide and this causes the arc to ignite after a time tз at the point A (tз – the arc ignition time). After exciting the arc with the peak of ignition – Uз voltage rapidly decreases to the voltage Uд (arc voltage). At the B point, since the source voltage (Uи) is less than the sum of the anode and cathode voltage drops of the arc, the arc fades. Up to the point, when Uи = 0 time – tу (time of the arc extinction). In the opposite half-cycle (T/2), the arc is excited at the C point, when the source «gains» the sufficient voltage level, however, in this case, there is a voltage peak – Uз (arc ignition voltage), and there is a pause – t3 (the arc ignition time). Between B and C points, the total pause time is tП = tз + tу. Such pauses of duration tп are observed 100 times in 1 second. Usually Uз/ Uд = 1,5…3. In this case, the idling voltage of the source is U2хх = 2Uд, that is, it is necessary to increase U2хх so that the arc is excited after its extinction. Sometimes (when deionizers enter the arc), it is necessary that U2хх = (2…4)Uд, and this is inadmissible from the security point of view (if Uд = 30V, then the maximum U2хх = 120V, and U2хх not more than 80V is permissible. With this, it was concluded that there should be sufficient inductance in the welding circuit – L.
In the case where the inductance is large (L = ∞, R = 0), the arc burns without pauses (Fig. 1b). This is due to the fact that in the circuit with inductance, the voltage vector of the source (Uи) is ahead of the current vector (Iд) by an angle φ. In this case, it is also necessary to ensure ignition of the arc (Uз > Uд), so that U2хх is larger than Uд. However, for the ratio Uз = (1,5…3) Uд in this case, U2хх = (1,8…2,5) Uд, that is much less than for the circuit, without inductance. In this case, the safety precautions are observed. The surface work of the critical dimension nucleus formation.